Oh SMF – What Happened To You? Friday the 22nd Douglas “The Bear” Hazard sent a mass message trying to get out the word about some disturbing facts about SMF [Simple Machines Forum] an open source forum software that started sometime ago. I will not go into details here, because they have a full explanation of what happened here. If you ever used SMF, take the time to read the article and try to help these guys spread the word out because one good piece of software is on the brink of extinction right about now. 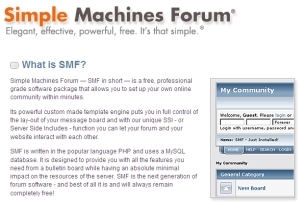 If you never used SMF, but you are using a forum software that does not meet all your expectations, SMF is for you, but first, read the article, and help the community develop the software further. This entry was posted in english, publicitate gratuita, review and tagged help, Simple Machines Forum, SMF by .marius. Bookmark the permalink.